As the day draws to a close and the sky darkens with thick storm clouds, our weary sailors are dismayed how to find their way. A few stars become visible, the captain calls out "Follow the North Star!" Finding relief, the sailors play some jigs, as others go about their evening tasks, bouyed by the melodies and knowing they will reach their destination. 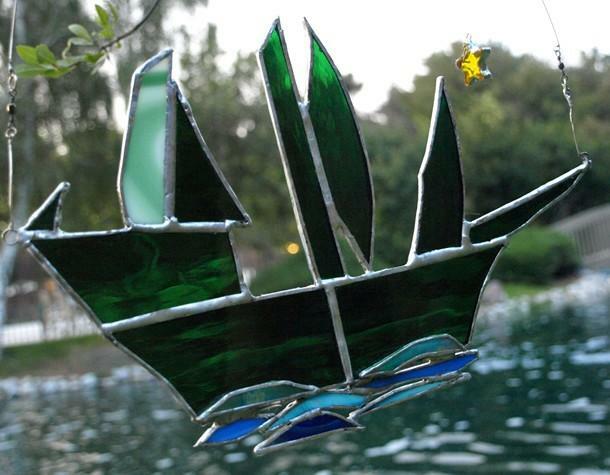 Using bits of scrap stained glass, The Green Galleon was designed by my 12 yr old grandson. 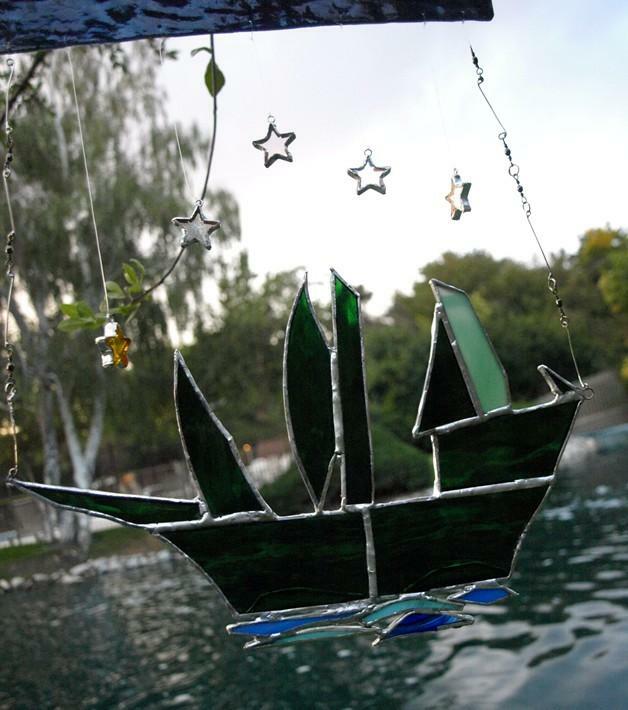 With emerald green, striated green & white, different blues stained glass, and the 5 stars, this unique 3 masted ship began to take shape. With some grinding to make the pieces fit better & to reduce the sharpness they were then taped with copper foil and soldered together. Done Tiffany style. 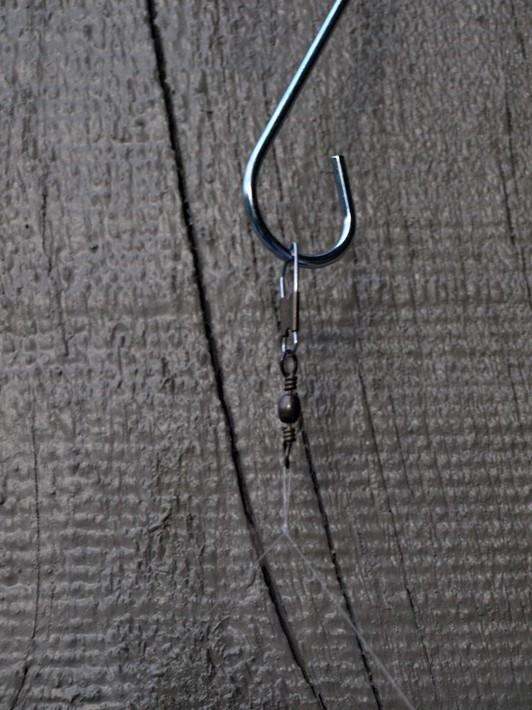 This fantastic piece comes together with swivels, strong fish line and bits of head pins & jump rings. Each head pin and jump ring is soldered to make it more secure. 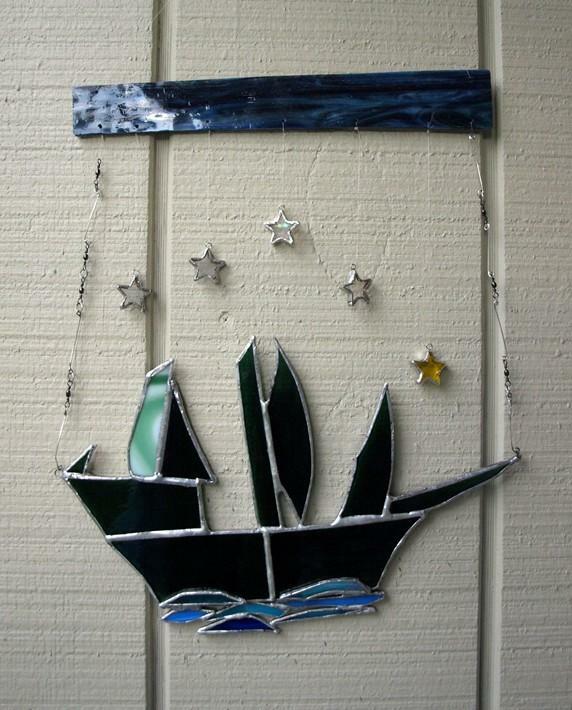 Keeping with the nautical theme, the entire piece is hung from a larger swivel, with strong fish line. 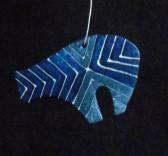 The entire length of the Green Galleon piece is 20.5", the dark blue sky is 10" wide, and the Green Galleon is 11" wide. 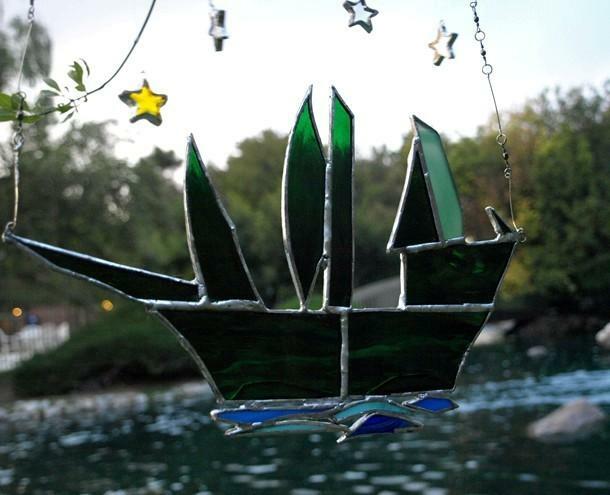 The Green Galleon will make a fabulous mobile in your young captains room, or hung where the sun can shine through the glass making bright color "shadows" along the walls and or floors. Thank you for stopping by my studio, Reflections, here on HandMadeArtists, wishing you a great day.